Hello! I've been wanting to play in the MFT Summer School all summer but it's been the busiest summer for me. So I'm happy to play at least once with this last lesson of Color Temperatures. I'll have to keep these lessons in mind when I lose my mojo and can't seem to start a card. I went with a warm color scheme in honor of this hot hot hot weather we have been having. It's a stretch for me as I prefer blues and greens but it's good to stretch my creativity a bit. 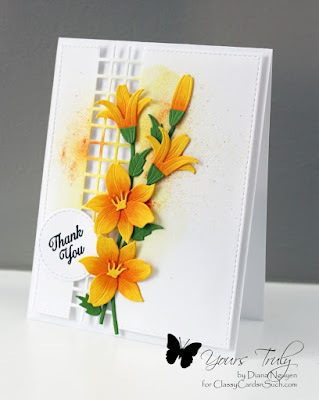 I started with a stitched white rectangle using MFT Blueprint 13 and sponged some Squeezed Lemonade near the center of my card. I then squeezed my spritzer just a couple of times before adding some Orange Color Bursts. It's hard to get a "controlled" look with the color bursts but I just love the look of the tiny splatters. It's perfect with the lilies since their pollen will do just that to your clothing! I then used the Impression Obsession Square Cutout Border down layer to remove some of the coloring and to add depth to the card by popping up the base layer with large foam tabs. My MFT Lily Die-namics were cut on yellow card stock, colored with Copics and then glued together with the Art Institute glue. I added a little thank you sentiment using ODBD Ornate Frame Sentiments with black pigment ink and clear embossing powder. The stitched circle is also from MFT Blueprint 13. Thank you for looking and I hope you enjoy the last couple weeks of summer! Gorgeous Thank You card. Love the warm colors and the spritz background. How striking! Your cards always seem the perfect balance of color and design without "too much" anything. It is a treat to see and enjoy them. Thank you! gorgeous.. i love the color combo you got going on here:) thanks for the share..
That border die is so much more versatile than I was able to imagine, and I like how you used it to limit the saturation of color overall. Beautiful.